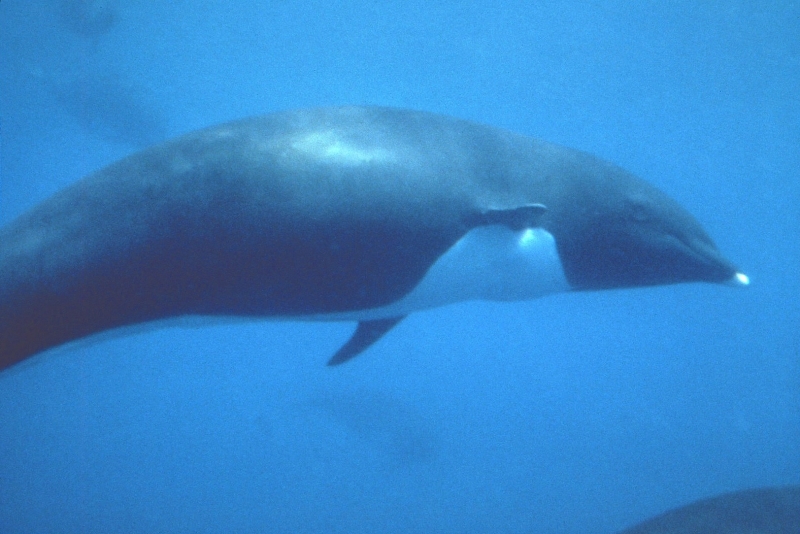 These cetaceans live in deep continental shelf & offshore waters where the temperatures vary between 8 and 24 degrees °C. 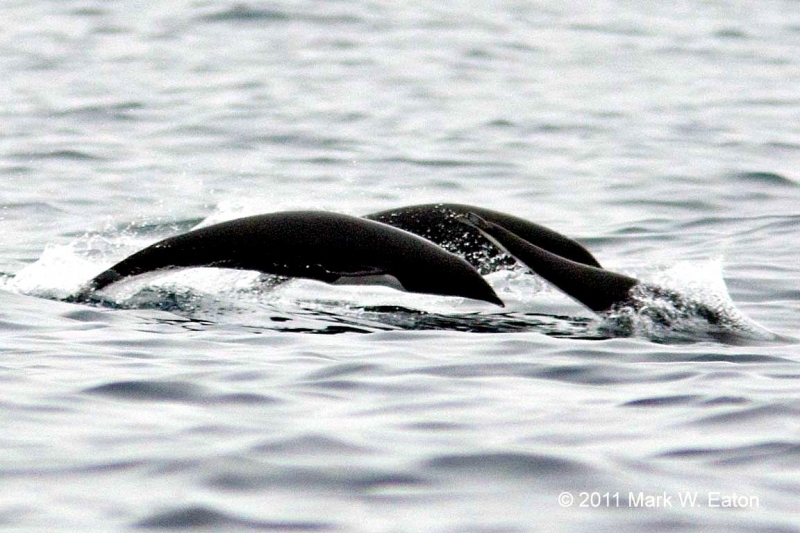 They approach shore only where very deep water can be found near the coast. 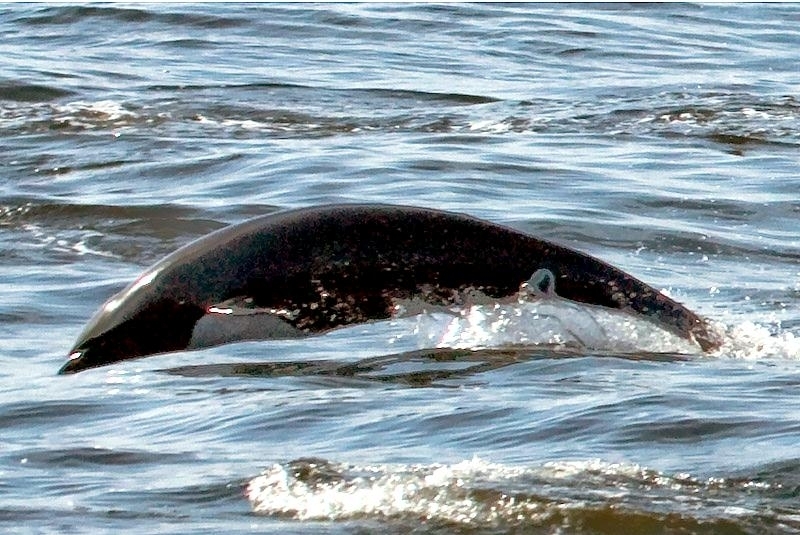 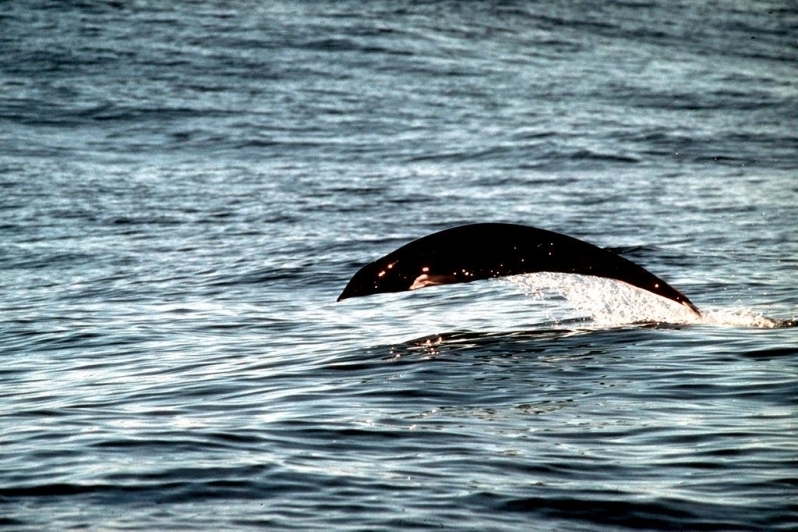 Northern Right Whale Dolphins have an unusually slender body shape and they do not have a dorsal fin or ridge. 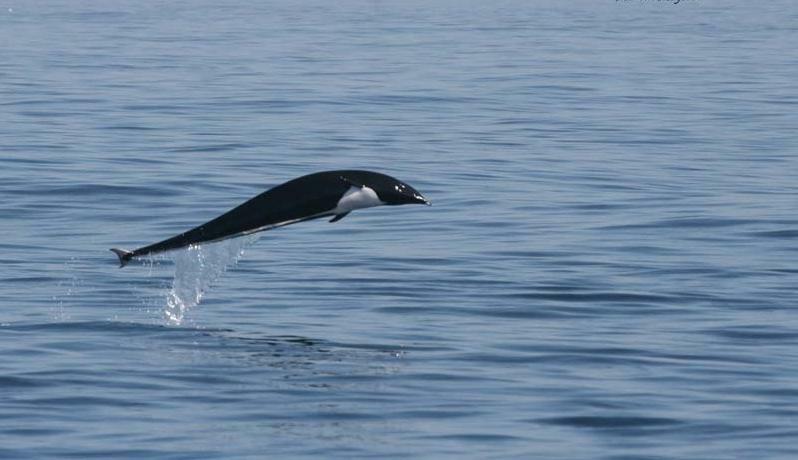 They have small, curved flippers and small flukes. 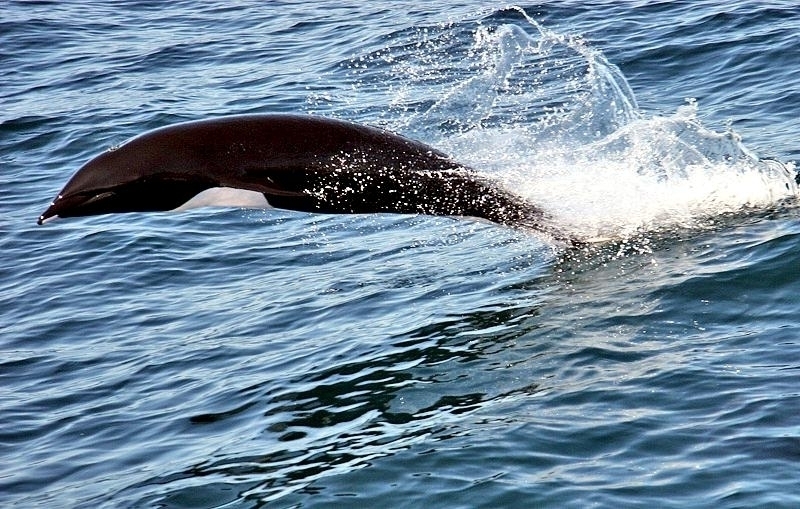 They are mostly black, but they have a well-defined white band on their belly. 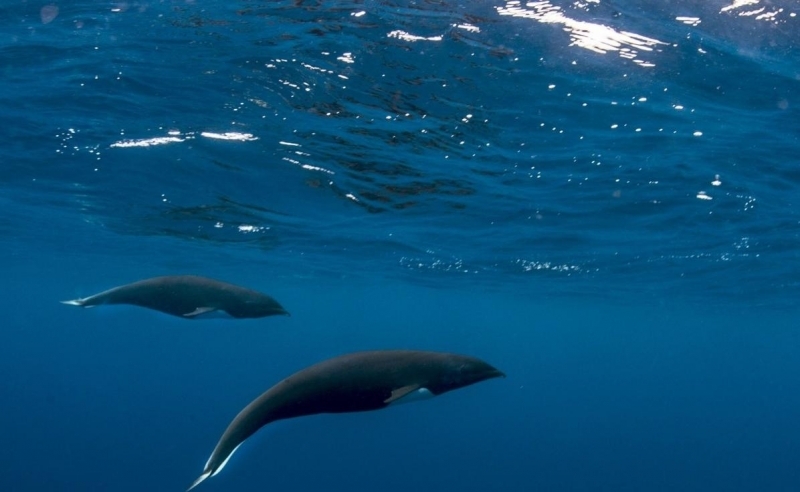 Males and females have the same body shape and color pattern, the only sexually dimorphism being that males can attain greater length (up to 3 meters) and weight than females. 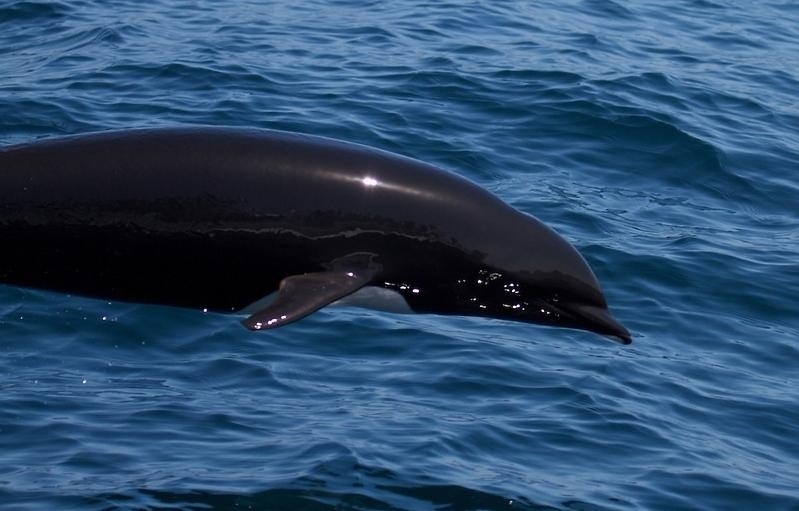 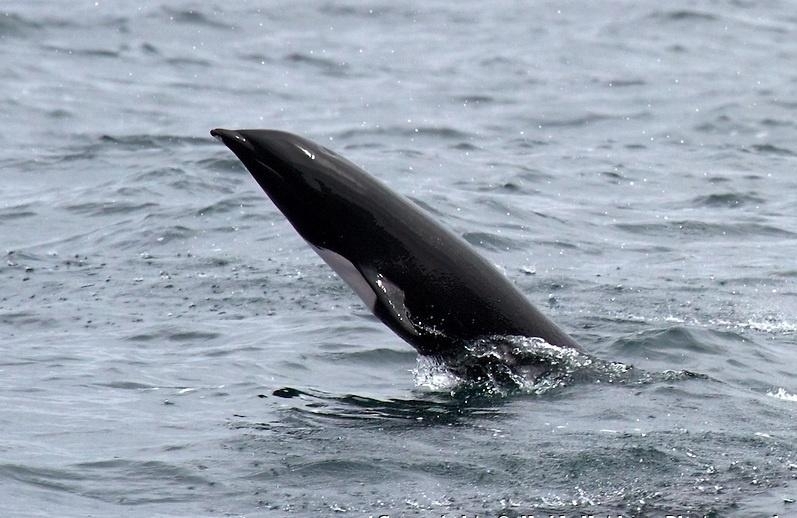 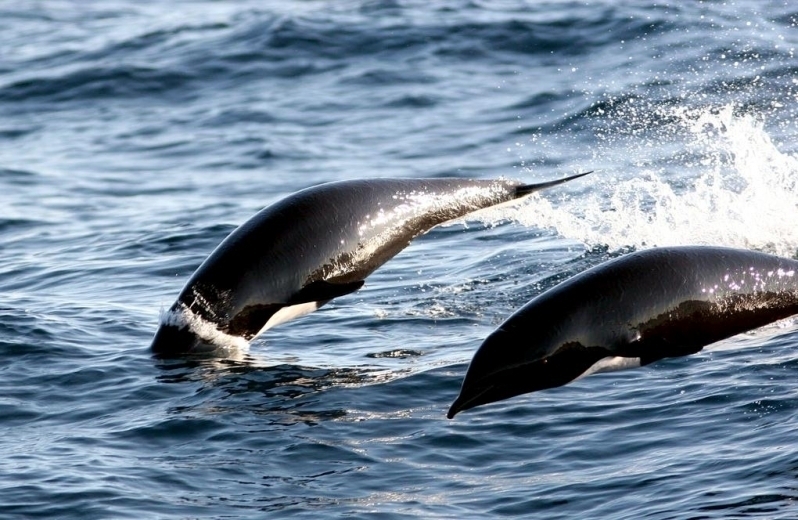 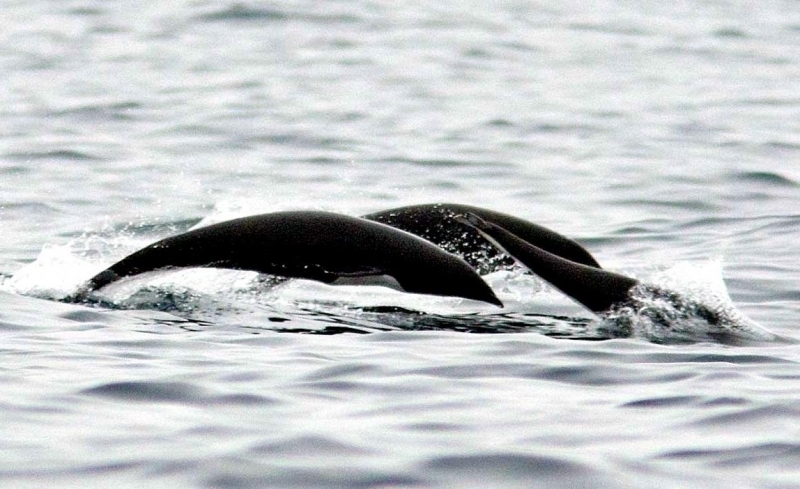 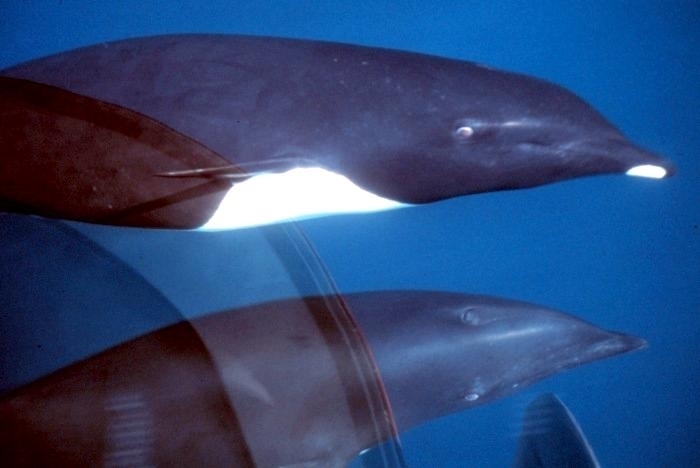 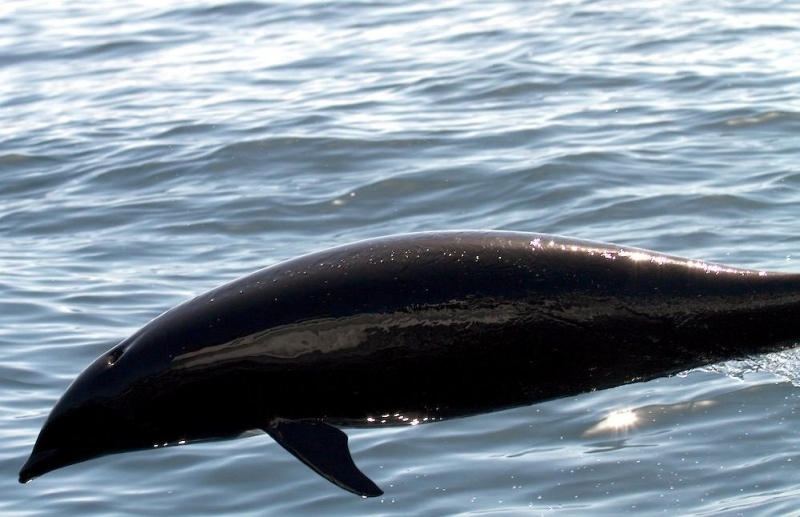 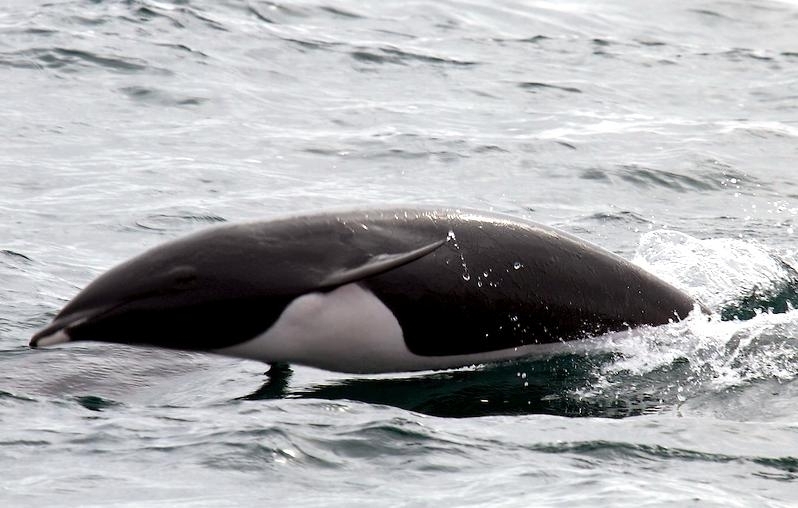 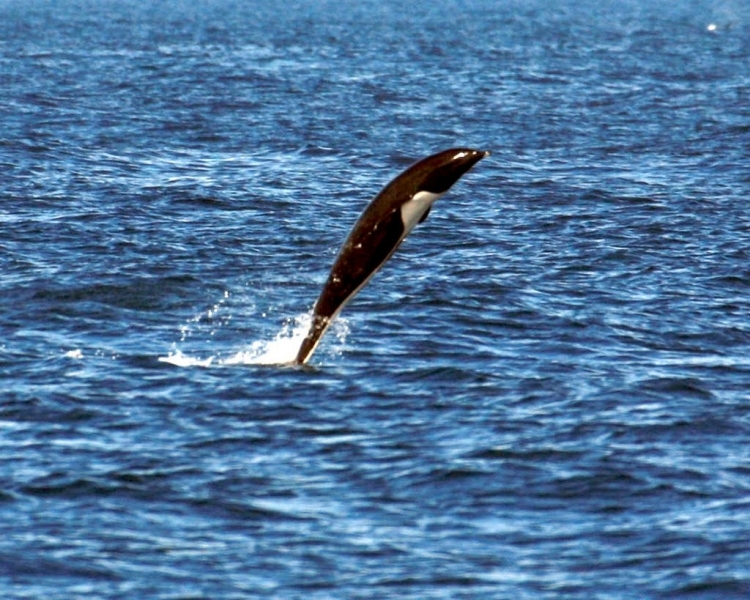 Virtually nothing is known about reproduction or mating of the Northern Right Whale Dolphin. 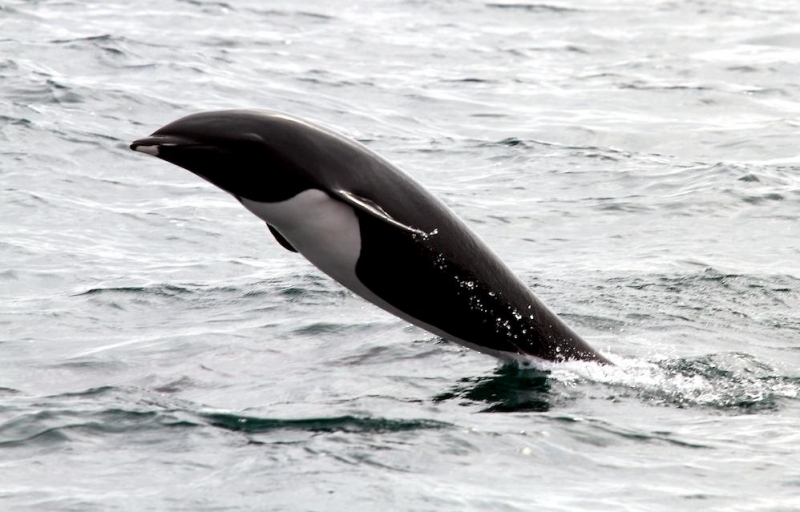 The abundance and distribution of Northern Right Whale Dolphins varies based on oceanographic conditions and seasons. 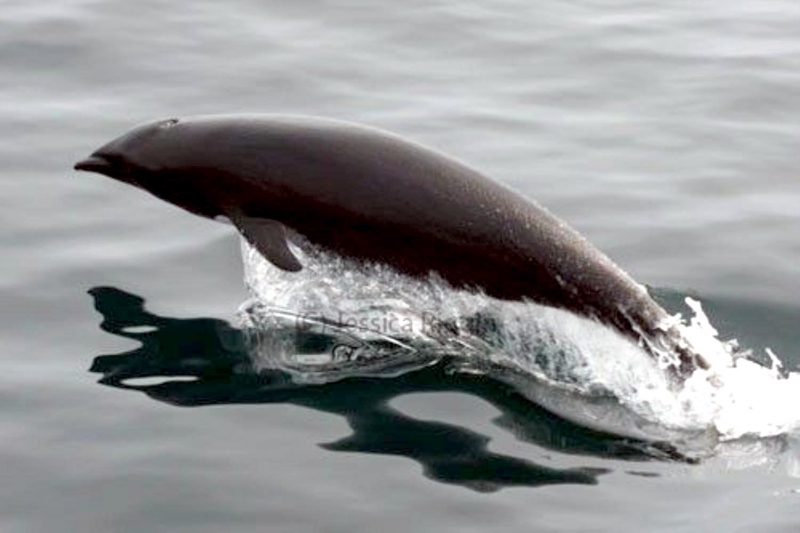 They are widely distributed across the North Pacific Ocean from northern Baja California (Mexico) to the Gulf of Alaska, Kamchatka (Russia) and Japan. 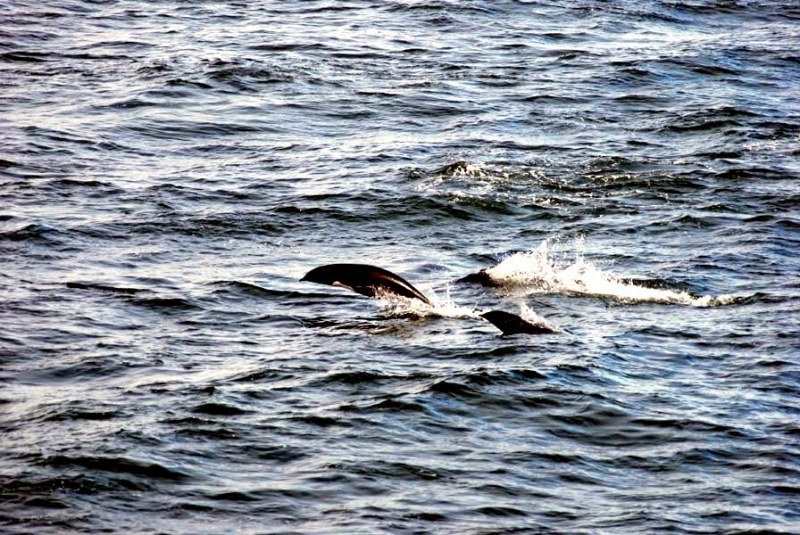 North-south movements have been documented based on water temperature changes, with the movements south during the colder winter and autumn months and north during the warmer spring and summer months. 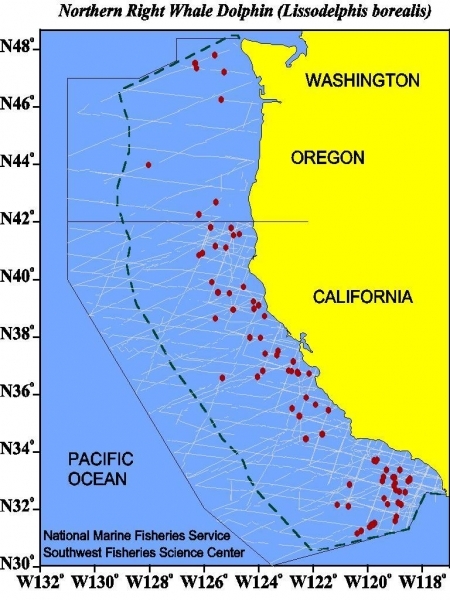 For management purposes, Northern Right Whale Dolphins inhabiting U.S. waters have been placed in a California/Oregon/Washington stock. 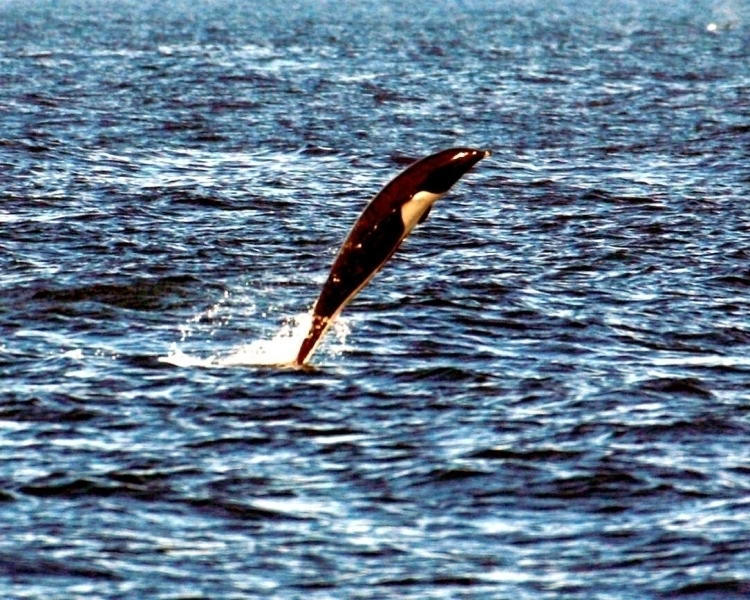 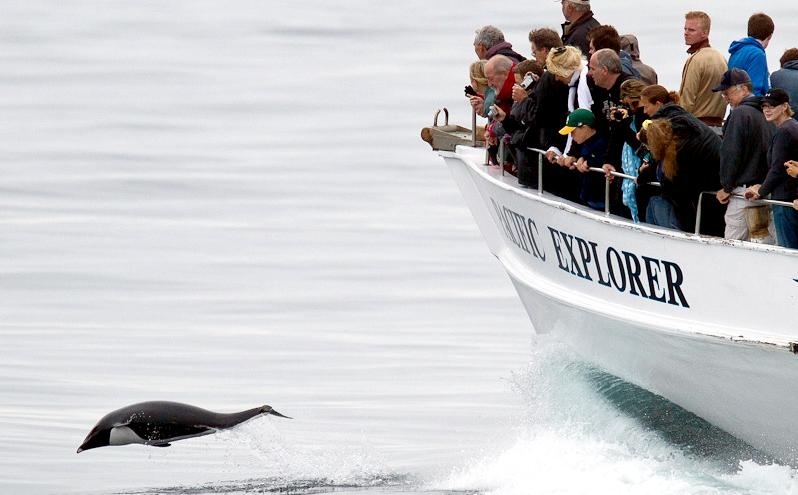 Off the west coasts of California, Oregon and Washington it is estimated that there are between 16,000-21,000 Northern Right Whale Dolphins. 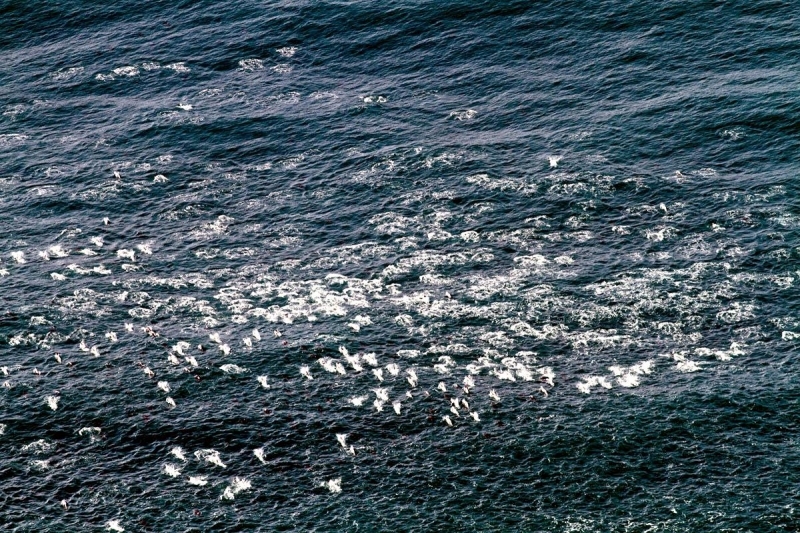 In the entire North Pacific Ocean, scientists estimate a population of about 68,000. 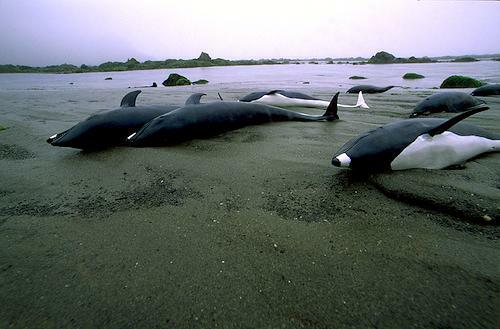 There are insufficient data for this species to determine the population trends. 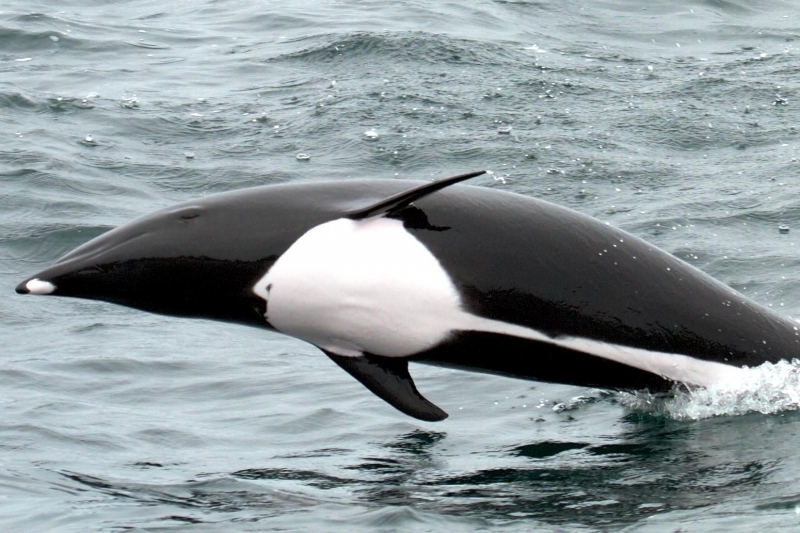 Northern Right Whale Dolphins usually travel in large pods of up to 2,000 individuals but the average pod size is about 200. 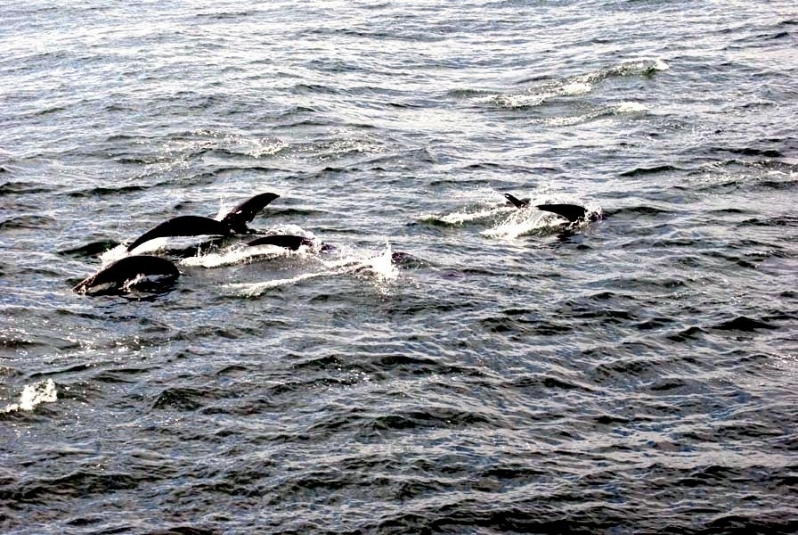 Pods sometimes swim in various geometric configurations, such as a V-shape. 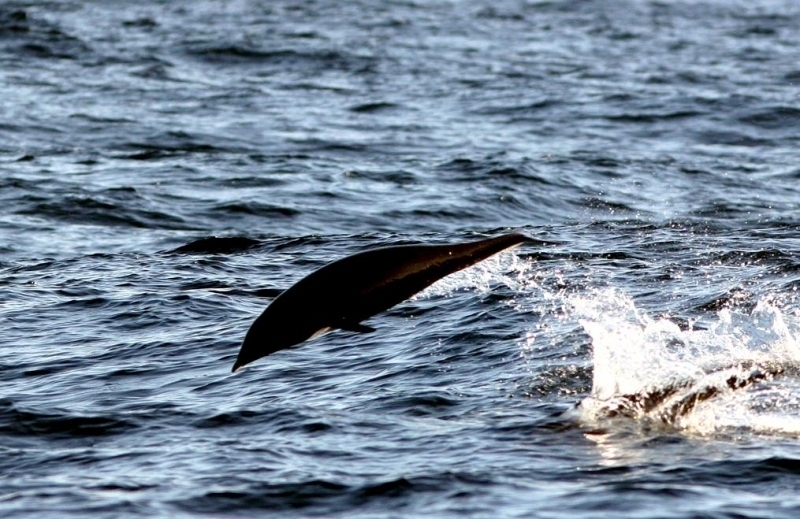 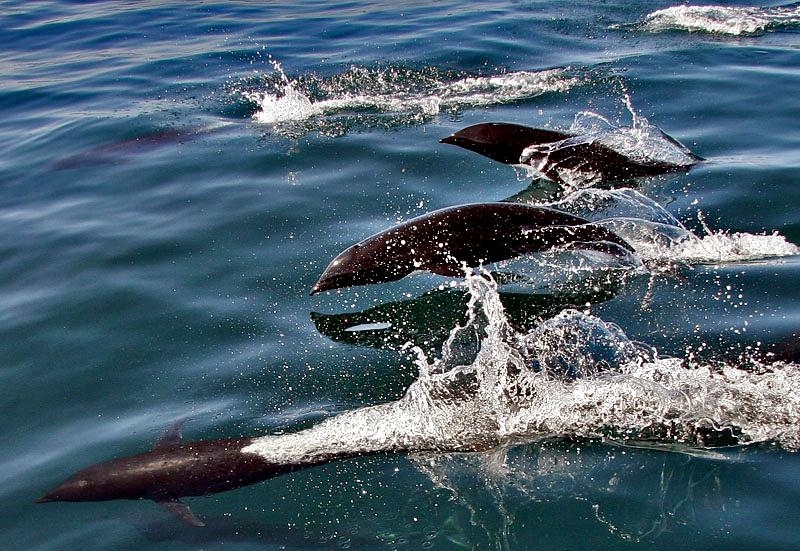 These dolphins can swim quickly, over 40 kilometers per hour. They can swim near the surface without greatly disturbing the water surface, probably because they do not have a dorsal fin. 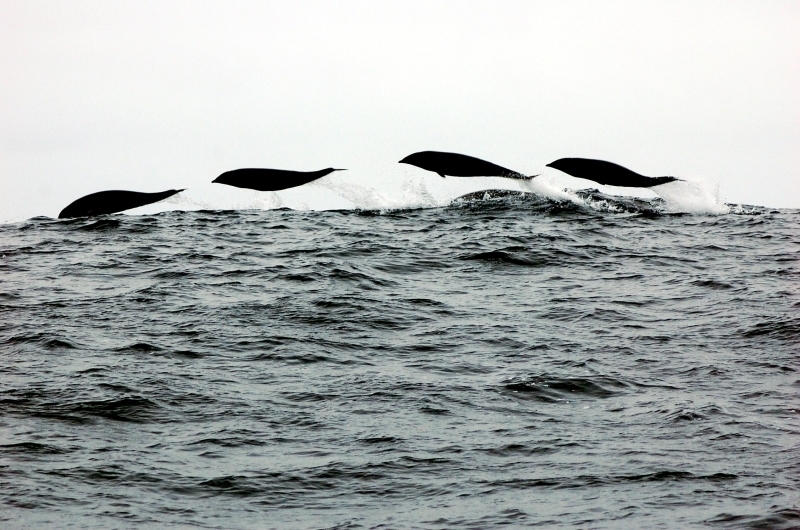 They are known to occasionally perform fluke slaps and breaches. 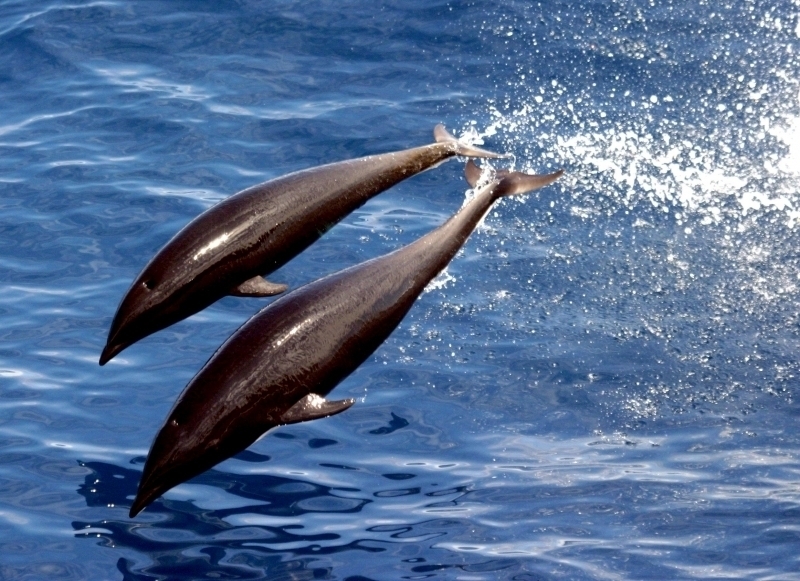 The maximum dive time that has been recorded for them is 6.25 minutes. 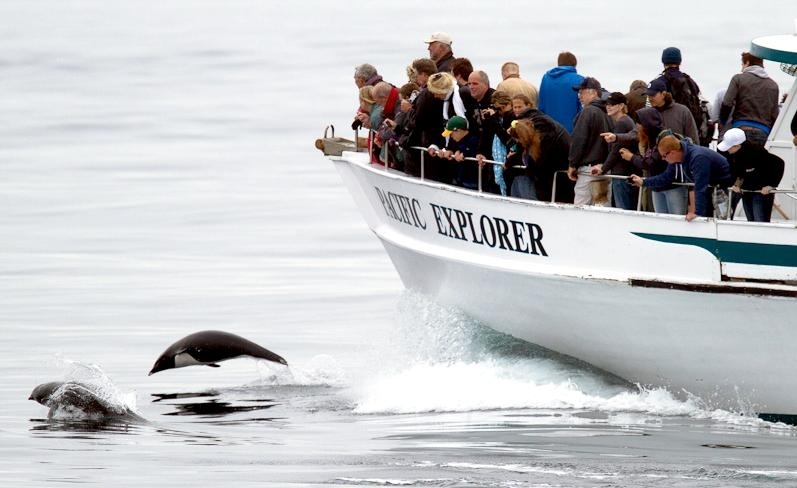 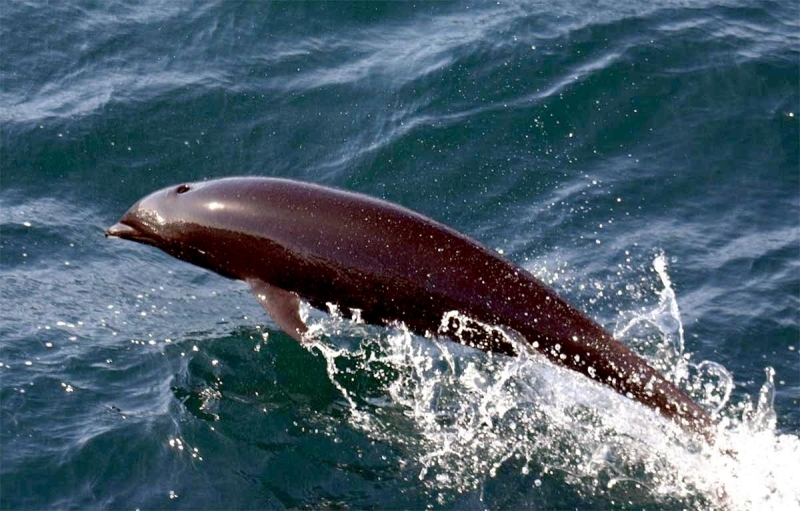 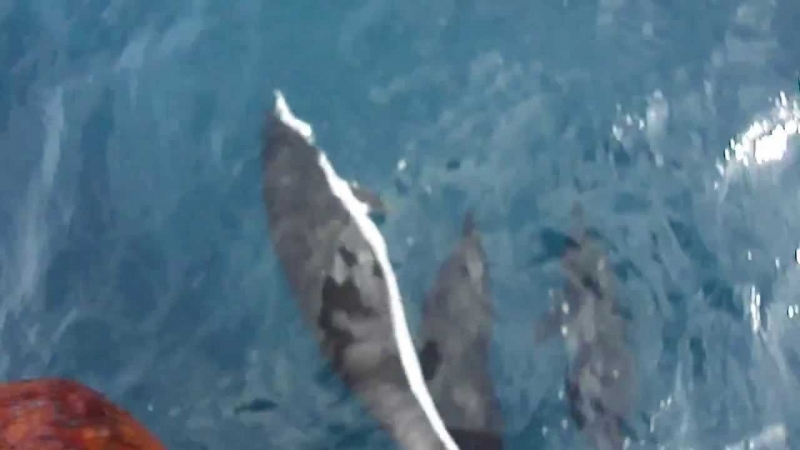 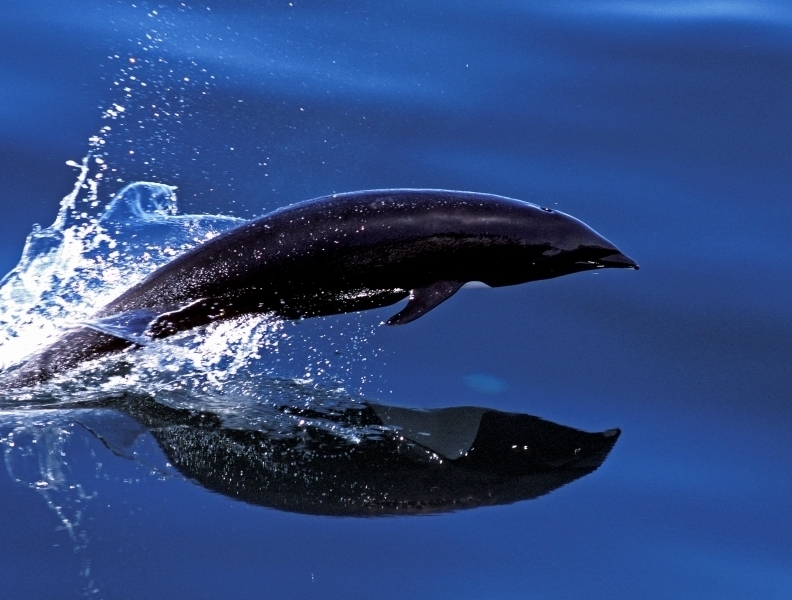 They often travel with other species of marine mammals, most commonly the Pacific White-sided Dolphin. 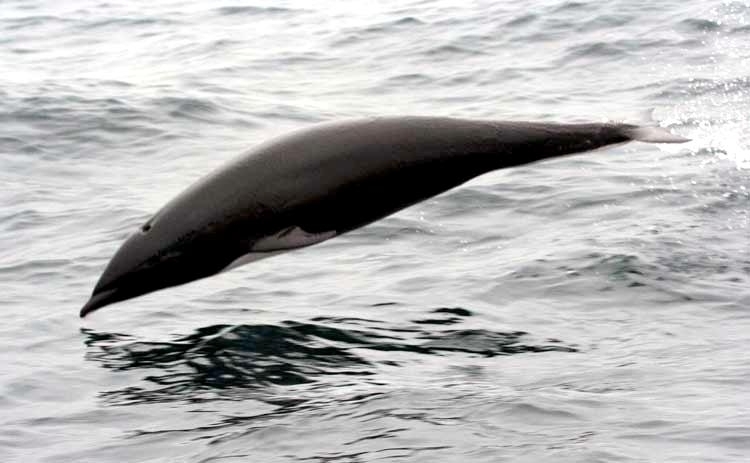 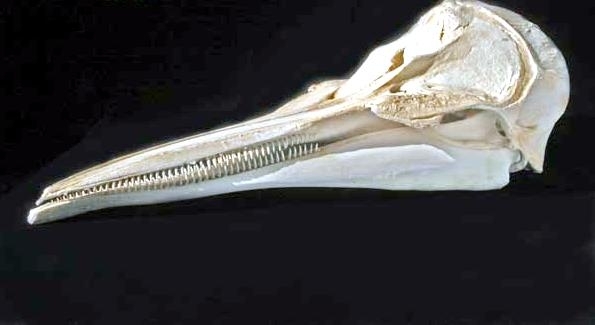 Northern Right Whale Dolphins feed mainly on squid and lanternfish, but they also eat other kinds of fish.